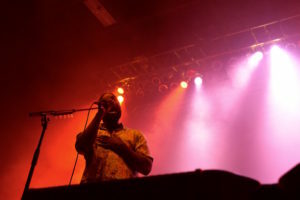 Bloc Party played to a crowd of around 300 Monday night at Stage AE indoors. For a band whose sound is often compared to that of Mogwai, Gang of Four, Joy Division and Blur, one would expect a high-energy affair. Instead, the group looked almost as bored as most of the crowd did for their brief set, which was barely over an hour including both encores. Now, I will say they had a lot working against them that night, specifically the DNC, which likely kept a large contingent of their Pittsburgh fan base glued to their couches, as the politics of late have become a nationwide obsession. 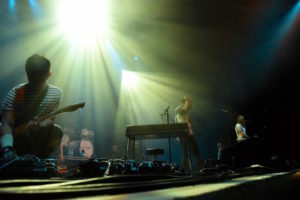 If I remember correctly, they played to a sold-out crowd at Mr. Smalls when they were here in 2013 – a markedly different experience as an audience member and probably different for the band as well, who were likely disappointed with the lack of attendance. Those few hundred people, however, felt like 2,000. I was stepped on twice, and while I’m not one to complain about rambunctious concertgoers, I couldn’t help but be annoyed with people trying to mosh three songs in during “Waiting for the 7:18” – one of the band’s lighter songs. I pretty much knew what to expect once that happened, so I waited for half of their set to pass until venturing back into the pit, only to be toppled onto again five minutes later. This sort of behavior at concerts is getting really old, and I can’t help but wonder if it’s unique to Pittsburgh. As someone who has been to a million shows in many different cities, I’ve definitely noticed a contrast between the audiences here versus other places, and I hate to tell ya this, Pittsburgh, but you just don’t know how to act at shows. I think the irritating crowd had something to do with the type of concertgoer who likes a band that has the unfortunate fate of releasing a stellar debut album with so much depth and appeal that all the folks who got into indie music once it became mainstream are now big fans ten years later. All the true music nerds who thought Silent Alarm was one of the best albums of 2005 have since moved on, and now we’re left with a bunch of yinzers who think going to see Bloc Party is as punk as going to a show at Rock Room. The people there weren’t even wannabe hipsters. They were straight up talking about how great Primanti’s is on smoke breaks between sets. Bloc Party’s set list speaks volumes to what they expect out of American crowds, and was a sample of their catchiest, most commercially-appealing songs. The concertgoers at Monday’s show didn’t care about the original members who have since been replaced (hey hot new bassist from Menomena!) – they wanted to hear Silent Alarm from start to finish, and unfortunately, no band worth anyone’s time tours forever off their first album. As musicians, Bloc Party played impeccably. Their level of musicianship really blew me away. For a band that hasn’t been playing together all that long, you’d think they had known each other for 20 years. I think that’s a big reason why it felt so rehearsed and predictable. There was no energy, despite the fact that most of their compositions and lyrics ooze electricity and emotion. I wanted more of a performance than they gave. 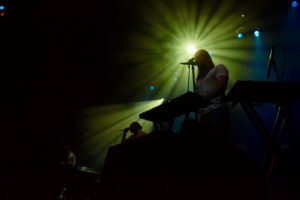 Ending a gig with “Have a really good week,” Bloc Party exited the stage and reinforced the transactional sentiment of the show. Maybe they were just having an off day. Peep our gallery to check out what you missed.